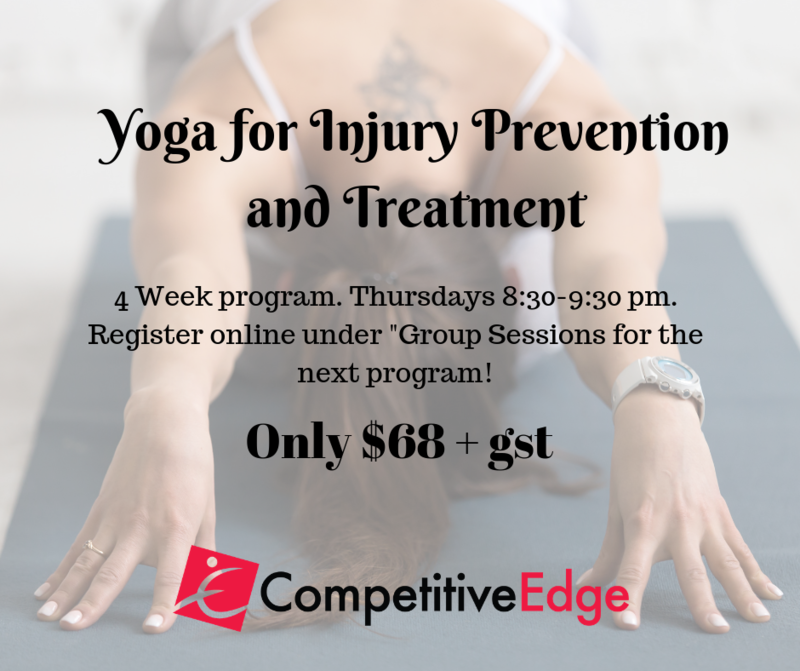 Our Yoga for Injury Prevention and Treatment Class is designed for those of you who are sick of your injury and aches and pains and are ready to work on strength, stability, flexibility, mobility, and body awareness and get back feeling 100%. This class is also great for those of you who despite your good intentions, have difficulty completing your rehab exercises as often as you should. It is an awesome whole body supplement to your Athletic Therapy treatment plan! And don’t worry- this class is open to all levels- no yoga experience necessary. Come try it out! Only $68 + gst for our upcoming 4 week program! Register online under “Group Sessions“. The first half of our class (Yang) will focus on postural alignment, and building strength and balance within basic postures . It will transition into a series of gentle flowing sequences, warming the body from the inside out. The second half ( Yin) will focus on calming down the nervous system and working into deeper tissues through sustained postures. Yin yoga aims to increase flexibility in the low back, hips pelvis, spine and shoulders.This practice is beneficial to those seeking pain treatment and treatment for injury recovery, and to athletes or others who wish to increase their range of motion or increase the flow of energy with in their bodies. Our Yoga for Injury Prevention and Treatment class is safe and beneficial for all types of injuries and is modified to be appropriate for everyone whether it is your first time trying yoga or if you are an experienced yogi. *Please bring a yoga mat and a water bottle. Mats will be available for rent for $2 if needed.